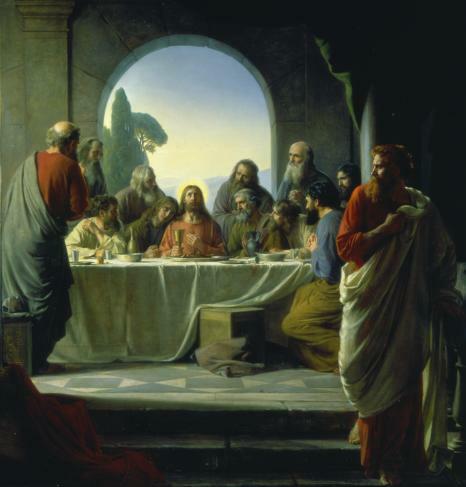 “Now as they were eating, Jesus took bread, and blessed, and broke it, and gave it to the disciples and said, ’Take, eat; this is my body.’ And he took a cup, and when he had given thanks he gave it to them, saying, ’Drink of it, all of you; for this is my bloodof the covenant, which is poured out for many for the forgiveness of sins.’” (Matthew 26:26-28). From the Upper Room in Jerusalem, from the Last Supper, in a certain sense, the Eucharist writes the history of human hearts and of human communities. Faith in Christ has profoundly penetrated into the consciousness and life of your [Irish] ancestors. The Eucharist transformed their souls for eternal life, in union with the living God. May this exceptional Eucharistic encounter of today be at the same time a payer for the dead, for your ancestors and forebears. With their help, may it become more fruitfully a prayer for the living, for the present generation of sons and daughters of today’s Ireland, preparing for the end of the twentieth century, so that they can meet the challenges that will be put before them. Yes, Ireland, that has overcome so many difficult moments in her history, is being challenged in a new way today, for she is not immune from the influence of ideologies and trends which present-day civilization and progress carry with them. The very capability of mass media to bring the whole world into your homes produces a new kind of confrontation with values and trends that up until now have been alien to Irish society. Pervading materialism imposes its dominion on man today in many different forms and with an aggressiveness that spares no one. The most sacred principles, which were the sure guides for the behavior of individuals and society, are being hollowed out by false pretenses concerning freedom, the sacredness of life, the indissolubility of marriage, the true sense of human sexuality, the right attitude towards the material goods that progress has to offer. Many people now are tempted to self-indulgence and consumerism, the human identity is often defined by what one owns. Thus they can become more selfish in their demands. Everybody wants a full freedom in all the areas of human behavior and new models of morality are being proposed in the name of would-be freedom. When the moral fiber of a nation is weakened, when the sense of personal responsibility is diminished, then the door is open for the justification of injustices, for violence in all its forms, and for the manipulation of the many by the few. The challenge that is already with us is the temptation to accept as true freedom what in reality is only a new form of slavery. And so, it becomes all the more urgent to steep ourselves in the truth that comes from Christ, who is “the way, the truth and the life” Jn. 14:6), and in the strength that he himself offers us through his Spirit. It is especially in the Eucharist that the power and the love of the Lord are given to us. The Sacrifice of the Body and Blood of Jesus Christ offered up for us is an act of supreme love on the part of the Savior. It is his great victory over sin and death–a victory that he communicates to us. The Eucharist is a promise of eternal life, since Jesus himself tells us, “He who eats my flesh and drinks my blood has eternal life, and I will raise him up at the last day” (Jn. 6:54). The Holy Sacrifice of the Mass is meant to be the festive celebration of our salvation. In the Mass we give thanks and praise to God our Father for having given us redemption through the precious blood of Jesus Christ. The Eucharist is also the center of the Church’s unity, as well as her greatest treasure. In the words of the Second Vatican Council, the Eucharist contains “the Church’s entire spiritual wealth” (Presbyterorum Ordinis, 5). On Sunday mornings in Ireland, no one seeing the great crowds making their way to and from Mass could have any doubt about Ireland’s devotion to the Mass. For them a whole Catholic people is seen to be faithful to the Lord’s command: Do this in memory of me. I have learned with great joy that large numbers also come to Mass several times a week and even every day. This practice is a great source of grace and of growth in holiness. Yes, it is from the Eucharist that all of us receive the grace and strength for daily living–to live real Christian lives, in the joy of knowing that God loves us, that Christ died for us, and that the Holy Spirit lives in us. Our full participation in the Eucharist is the real source of the Christian spirit that we wish to see in our personal lives and in all aspects of society. Whether we serve in politics, in the economic, cultural, social or scientific fields–no matter what our occupation is–the Eucharist is a challenge to our daily lives. We cannot live on the glories of our past Christian history. Our union with Christ in the Eucharist must be expressed in the truth of our lives today–in our actions, in our behavior, in our lifestyle, and in our relation ships with others. For each one of us the Eucharist is a call to ever greater effort, so that we may live as true followers of Jesus: truthful in our speech generous in our deeds, concerned, respectful of the dignity and rights of all persons, whatever their rank or income, self-sacrificing, fair and just kind, considerate, compassionate and self-controlled-looking to the well being of our families, our young people, our country, Europe and the world. The truth of our union with Jesus Christ in the Eucharist is tested by whether or not we really love our fellow men and women; it is tested by how we treat others, especially our families: husbands and wives, children and parents, brothers and sisters. It is tested by whether or not we try to be reconciled with our enemies, by whether or not we forgive those who hurt us or offend us. It is tested by whether we practice in life what our faith teaches us. We must always remember what Jesus said. “You are my friends if you do what I command you” (Jn. 15:14). The Eucharist helps love to triumph in us–love over hatred, zeal over indifference. The call to conversion in the Eucharist links the Eucharist with that other great Sacrament of God’s love which is Penance. Every time that we receive the Sacrament of Penance and Reconciliation, we receive the forgiveness of Christ, and we know that the forgiveness comes to us through the merits of his death–the very death: that we celebrate in the Eucharist. In the Sacrament of Reconciliation, we are all invited to meet Christ personally in this way, and to do so frequently. This encounter with Jesus is so very important that I wrote in my first encyclical letter these words: “In faithfully observing the centuries-old practice of the Sacrament of Penance–the practice of individual confession with a personal sorrow and the intention to amend and make satisfaction–the Church is therefore defending the human soul’s individual right: man’s right to a more personal encounter with the crucified forgiving Christ, with Christ saying through the minister of the Sacrament of Reconciliation: ‘Your sins are forgiven; Go and do not sin again.’ Because of Christ’s love and mercy there is no sin that is too great to be forgiven; there is no sinner who will be rejected. Every person who repents will be received by Jesus Christ with forgiveness and immense love. I wish also at this time to recall to you an important truth affirmed by the Second Vatican Council, namely: “The spiritual life, nevertheless, is not confined to participation in the liturgy” (Sacrosanctum Concilium, 12). And so I also encourage you in the other exercises of devotion that you have lovingly preserved for centuries, especially those in regard to the Blessed Sacrament. These acts of piety honor God and are useful for our Christian lives; they give joy to our hearts, and help us to appreciate more the liturgical worship of the Church. The visit to the Blessed Sacrament is a great treasure of the Catholic faith. It nourishes social love and gives us opportunities for adoration and thanksgiving, for reparation and supplication. Benediction of the Blessed Sacrament, Exposition an Adoration of the Blessed Sacrament Holy Hours and Eucharistic processions are likewise precious element of your heritage–in full accord with the teaching of the Second Vatican Council.